The Pye History Project is an industrial and social history program operated by the Pye History Trust to research, document and record the history of the Pye Group of Companies between 1896 and the present day. The project is funded by the Pye Foundation Trust and incorporates the Pye Telecom History project. The long-term objective of the project is to establish or participate in a public museum which will adequately interpret and display the full extent of the scientific and technological discoveries and innovations which originated in Cambridge and the surrounding area. The Pye Group was always headquartered in Cambridge, England. 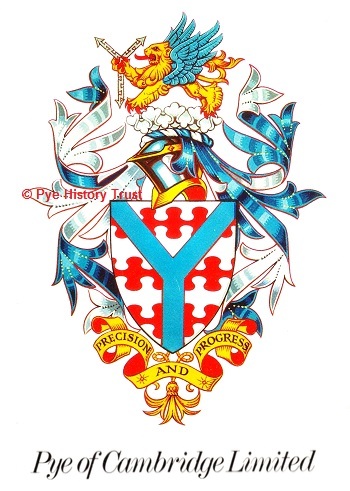 The Pye History Trust project group are carefully and professionally researching the history of Pye using the remaining Pye archives, by contact with former Pye Group managers and staff, and by the use of other reliable primary, secondary and tertiary sources. The results will be documented for posterity and will contribute to a future permanent exhibition in Cambridge which will celebrate the many and wide ranging achievements of the Pye Group of companies. Why are we doing this and what is the driving force behind the project? How can a company employing 14,000 local people just disappear? The Pye History Project aims to correct some of the misconceptions of the origins and history of the ‘Cambridge Phenomenon’ of scientific, electronics and computer companies (sometimes dubbed ‘Silicon Fen’), whereby the contribution of the Pye Group often appears to get overlooked. Most seem to think that the evolution of this East Anglian phenomenon began in the 1960s with recognised innovators such as Mr. Clive Sinclair or organisations such as Acorn Computers etc. However, much earlier, there were significant other contributors who laid the foundations for scientific discovery and technology industries in the area. In fact it all began in the Cavendish Laboratory of the University of Cambridge, and it was breakaway groups from this laboratory who founded companies such as W. G. Pye & Co, the Cambridge Instrument Company and Unicam Instruments. Sir Arthur Marshall OBE, founder of Marshall Engineering, was a graduate of Jesus College, Cambridge. These founders, the companies they created and the people who worked there deserve a science and technology museum in Cambridge. Today, some of the remaining descendants of the Pye Group are still visible, such as Sepura PLC and Team Simoco Group, who both remain leading Companies in the field of radio communications worldwide. All the rest have disappeared, except their legacy. Of the other original science-based Cambridge companies only Marshall Group continues as a major engineering force, now operating in the fields of aerospace and defence, motor retailing & leasing, fleet transport and property. Marshall Group also operates Cambridge Airport. The electron microscopes, once pioneered by Cambridge Scientific Instruments, are now part of Carl Zeiss Microscopy, based in the old Pye TVT building.